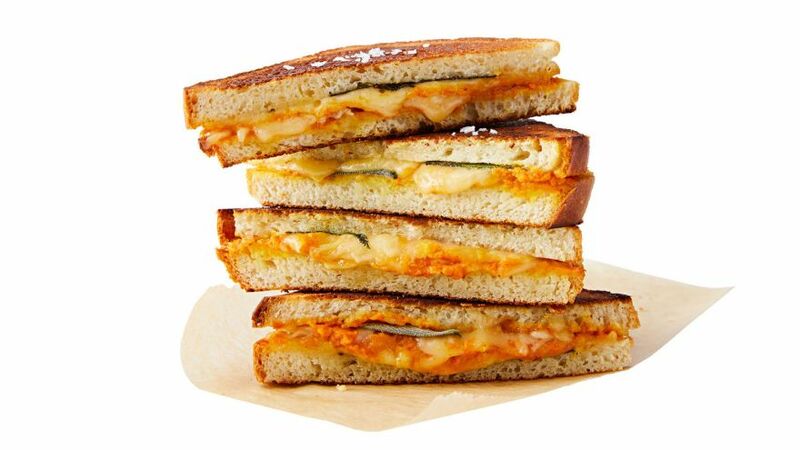 The Grilled Cheese Sandwich Recipes Perfect for Any Party You’re Hosting! Grilled cheese is an all-time classic and even though it can be very comforting to relax with a regular grilled cheese and a cup of soup on a cold day, there are dozens of ways that you can elevate a traditional classic. 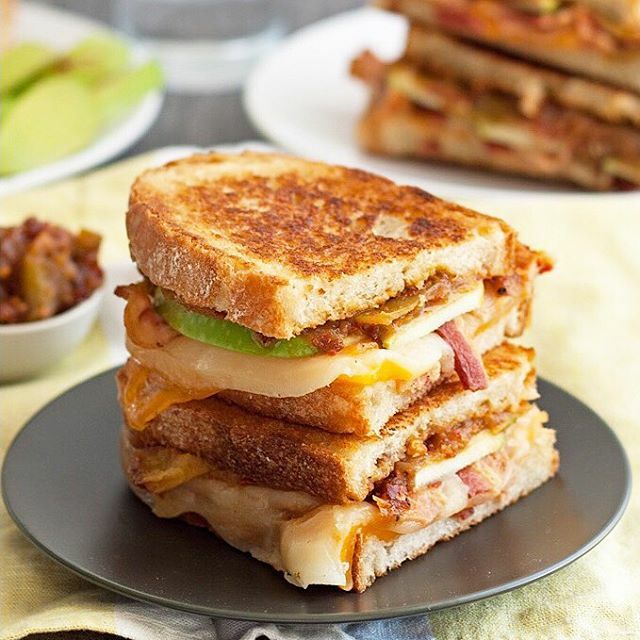 When it comes to hosting parties, you’re going to want to create the most succulent meals possible, and with the help of these fantastic grilled cheese sandwich recipes, you’ll be able to serve your guests something they’ve likely never had before. With some of the most elevated ingredients we’ve ever seen used in a traditional grilled cheese, this recipe is sure to impress even the most sophisticated palates. Consider serving it at a formal dinner party to as a fantastic appetizer during cocktail hour. Roast the chiles on the stove until the skin has been entirely blackened, throwing them in a plastic bag to cool. Pour the white vinegar over your sliced onion and allow to sit for five minutes. Add in equal amounts of mayo and Dijon mustard, mixing until combined. This will be the sauce for the grilled cheese. Scrape the blackened skin off of the chiles and remove the seeds and then take the softened butter and coat the outside of two pieces of rye bread. Take the rye and spread the mayo/Dijon sauce on the inside of each piece, adding 2 slices of provolone and 2 slices of cheddar cheese, 2 slices of tomato and roasted chiles. 2 slices of onion, and finish with another slice of provolone. Toast your grilled cheese sandwich over low-medium heat in a skillet until the cheese has been thoroughly melted. Arguably one of the most delicious types of cheese you can get your hands on, this triple brie melt grilled cheese is sure to envelop your taste buds in soft creaminess that you aren’t going to forget any time soon. Take the two pieces of white French loaf and spread the butter generously on the outside of the bread. On the inside of the bread, take the strawberry preserves and apply generously, topping it off with the thinly sliced prosciutto. Add the sliced brie to the center of the sandwich and then cook in a Panini press for approximately 3 minutes (or until golden). You can also fry the sandwich in a skillet on low to medium heat until golden. What we love the most about this recipe is that it’s the type of meal that could easily work for lunch or breakfast, as there are several different ingredients that are adaptable to any time of day. Plus, you likely already have all of the ingredients in your house, so it’s a great midday snack to throw together. Heat a saucepan over low heat and add in the spinach and cook until it’s wilted. Once finished, drain out any extra liquid and chop it coarsely. Spread the Dijon mustard on four slices of bread and arrange the cheese, turkey, and spinach on top, adding the four additional bread slices on top. Using a shallow bowl, whisk the milk, eggs, and salt and pepper together, dipping each sandwich in the mixture so that it’s coated with the mixture. Melt half of your butter over medium heat and begin frying the sandwiches, until golden. Once fried, place the sandwiches on a baking sheet and put in the oven at 400 degrees until the cheese has been fully melted. 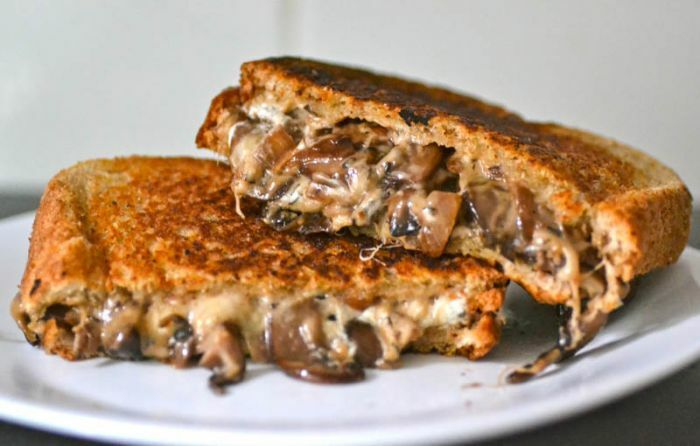 With the combination of mushroom and cheese, this hearty and savory take on traditional grilled cheese is ideal for a cold winter’s night or afternoon. It’s so delicious that even your kids will be interested in trying it out, not to mention it doesn’t involve any meat so it’s a great alternative for vegetarians. Prepare a saucepan over medium heat and add in the olive oil, onions, and mushrooms, sautéing for about 5 minutes. Add in the garlic and veal stock until the liquid has been reduced and then remove it from the heat and add in the parsley, salt, and pepper. To prepare the sauce, melt the butter over medium heat and add in flour, mixing constantly. Whisk in the milk until the mixture is thickened and add in the Gruyere cheese over medium to low heat and then set aside. Take each piece of bread and use the remaining butter to coat the outside of each piece. You can then take the mixture of mushrooms and spread it over the non-buttered side of the bread, topping it off with your cheesy sauce and then cover with the other piece of bread. Heat another frying pan over medium heat and cook the grilled cheese until golden on both sides. You can then garnish the sandwiches with more of your mushroom mixture and/or cheese sauce. 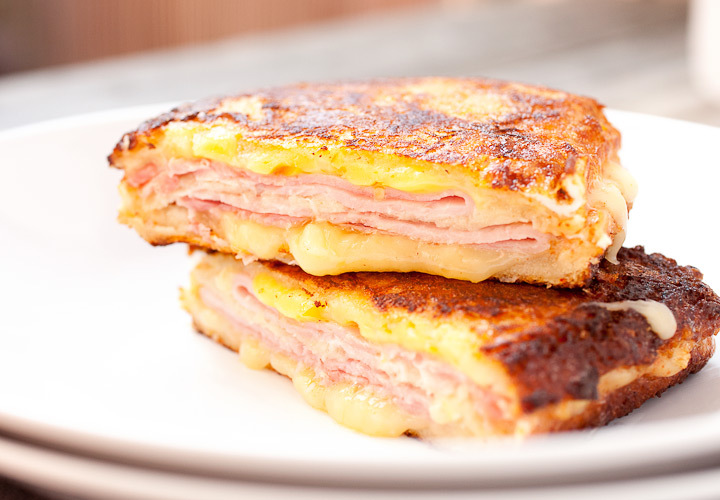 You can bet that there are plenty of fabulous grilled cheese recipes designed to appease any palate, ranging from kids to adults. 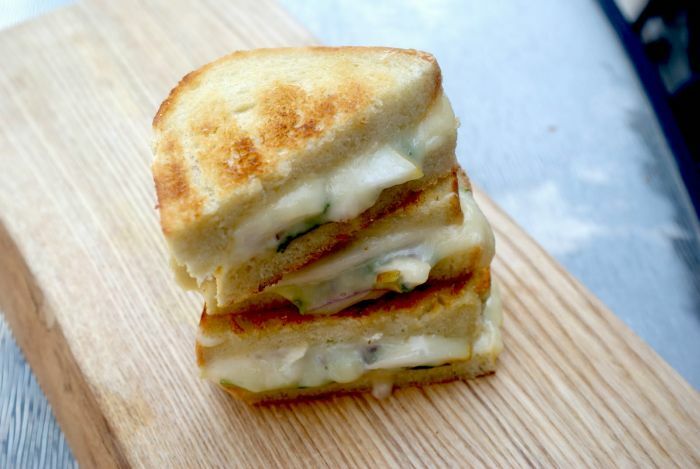 With the help of these four recipes, you’ll have the perfect grilled cheese to bring to your next function or to serve at the next party you intend on hosting.